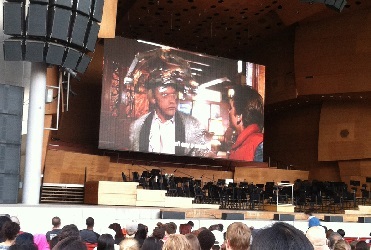 Free movies at Millennium Park. Watch a movie al fresco and for free every Tuesday during the Millennium Park Summer Film Series. When: Tuesdays, June 5 – August 21, 2018, 6:30pm, except on July 9 at 11am. Where: Jay Pritzker Pavilion, Millennium Park, 201 E. Randolph St.
Millennium Park will once again present outdoor movies on its state-of-the-art, 40-foot LED screen. Chicagoans and visitors are invited to take a seat at the Jay Pritzker Pavilion or enjoy the show from the Great Lawn. Schedule is subject to change. Movie goers are invited to sit at the Jay Pritzker Pavilion (first come, first served) or picnic on the Great Lawn. Millennium Park has increased security this year with a bag check along the perimeter of the park but you can bring food and beverages (including booze) into the Pritizker Pavilion seating area as well as the lawn. Food and beverages are also available for purchase. Looking for picnic options Cheap eats around Millennium Park.